Our last post was on bugs – something to definitely be wary of when you expect to keep rugs in storage for months or years. Several years ago we had a semi truck pull up with an ENTIRE storage facility of rugs brought to us. The property was on some low lands (not uncommon) and the units were flooded. Besides of course the expected problems with dye bleed in rugs improperly exposed to water, we also opened up rugs eaten by bugs because they had been stored dirty and left alone for YEARS. If rugs are going into storage they MUST be washed, and ideally treated with an insect repellant, or packed with cedar chips, or (my least favorite) moth balls. When wrapping a rug for storage, use PAPER not plastic. Wool has a moisture content, and with temperature changes it can “sweat” and create a mildew problem or musty odor. The rug needs to be able to breathe. We use Tyvek paper when we wrap rugs – it’s tear-resistant (to keep rodents out) and water-resistant. Tyvek (white) for long term wrap, Kraft (brown) for short term. We use Kraft paper for short term wrap, and Tyvek for long-term. 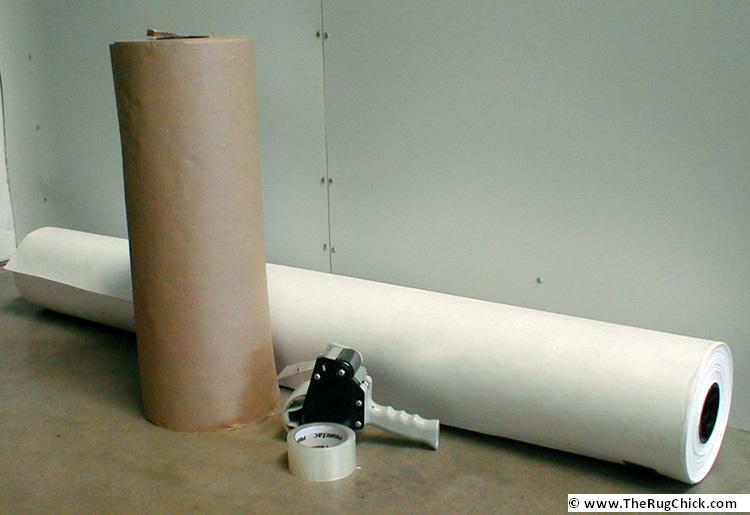 We buy Kraft paper at any Grainger, and we order rolls of Tyvek at Material Concepts. If you have multiple rugs to store, it is easy to write on Tyvek with a Sharpie pen or other permanent marker, and we like to put photos of the rugs on the ends as well so you can SEE which rug is which. This is very helpful if you are moving and a number of rugs in your big moving truck. Photos or text on wrapping let's you quickly identify your rugs. A few final storage tips: elevate the rugs on chairs or boxes in your unit (in case it floods), and have photographs and measurements on file (in case they are stolen). 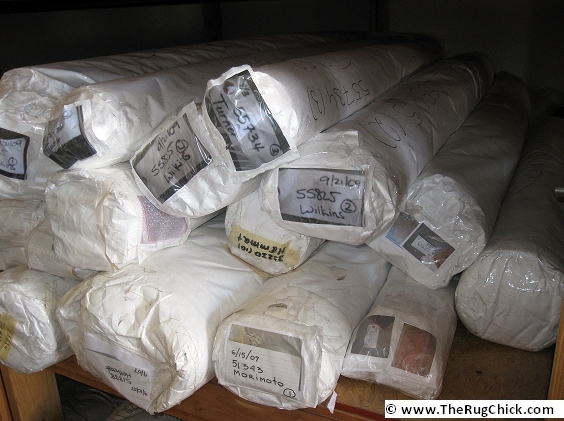 Hopefully these tips will help you protect your investment rugs when they go into storage.